Just press Barney heart to hear him sing his favorite song: "I Love You." Snuggle up close with this lovable, huggable and musical Barney. Parents can always use a hand at feeding time. 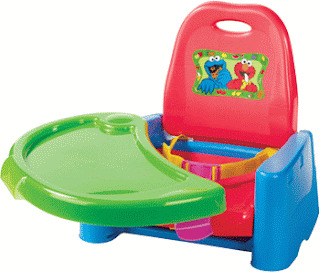 This unique swing-away tray releases and adjusts with one hand, making it easier for a parent to get their child in and out of the seat. And when mealtime is someplace other than home, it's lightweight and folds up compactly for easy transport. 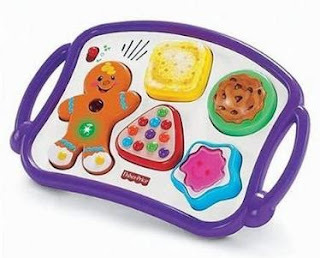 Includes three height adjustments so it can grow with your little one, and is dishwasher-safe so mealtime messes are easier to clean up. Also features a three-point safety harness for added child safety. From 6 months. NOW RM90 Only including postage by pos parcel. 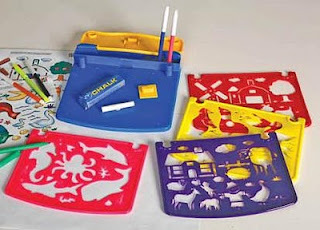 Take Anywhere Creative Stencil Board Set Encourage your child’s creativity and drawing skills with this versatile Stencil Board Set. Press the orange ball button on the camera to hear the color and object's name in the lens of the camera. Press again for music theme of object and once more for the name of the object and sound it makes. When ready for the next picture press the green button to change the picture in the lens. It also has a volume control. It can be converted to low chair. Separate table for growing child. This cuddle toy looked like a friendly, brightly coloured dragon, and babies enjoyed seeing its light-up heart dance to music. squeeze the tail, enjoyed hearing the toy talk about letters, number or shape or sing familiar songs. once the toy was on, its music and flashing heart-light were activated by motion sensor. Hello, is baby ready to learn? A friendly character is ready to help, along with real photo images of animal friends! With button-pressing, page-flipping fun, this phone introduces baby to numbers and counting, animals and their sounds, and first greetings. Pick up the receiver to hear friendly greetings (Quack Quack!). And there’s pull-along fun for new walkers! Requires 3 “AA” alkaline batteries (not included). * Mommy tiger loves to sing to her baby. * Whether playing or pouncing, this pair is always having fun! * Baby tiger has clicking head and legs. * Turn mommy's head to hear the sweet song she sings-and sing along with your little one! 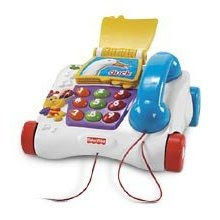 * Includes 3 button cell batteries. Tummy Time is so much fun, especially when you play together. 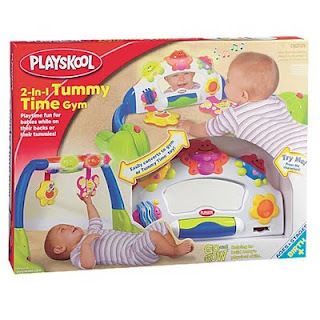 Playskool's convertible Tummy Time Gym features lots of interactive toys and helpful hints to enhance baby's floor play. Music, lights and soft 'n silly characters encourage baby to take part in the fun, while 'Lets Play Together' tip cards provide you with game ideas and instructions.